These LUXOR Styling Shears are made of ice tempered stainless steel which is known as extremely durable and thus long-lasting material which also resists rust and tarnish, staying sterile, clean and shiny for long time. Both of their blades are razor edge blades which are razor-sharp, ensuring fast, precise and smooth cut. These LUXOR scissors are 7.5 inches long which are considered to be long shears, if average length of hair cutting shears is 6.5 inches, but their weight is about 3 ounces. Unfortunately, they do not have an option of tension adjustment, but they have non-removable finger rest for stress relieving from hands and shoulders to prevent occupational diseases. Finger rest also stabilizes hand and cutting edge, providing precise and smooth cut. They also do not have rubber finger inserts which usually improve comfort and provide size adjustment. It should be mentioned, that this LUXOR product does not come with any storage case, therefore, if you need some case for your tools, you have to buy them separately. These LUXOR Styling Shears have appearance of classic hair cutting shears, but their length is a little bit longer. They are silver color with slight polish for mirror brilliance. Their blades and finger holes are symmetric, but one of finger holes is a little bit bigger than other, so barber can put several fingers in it. 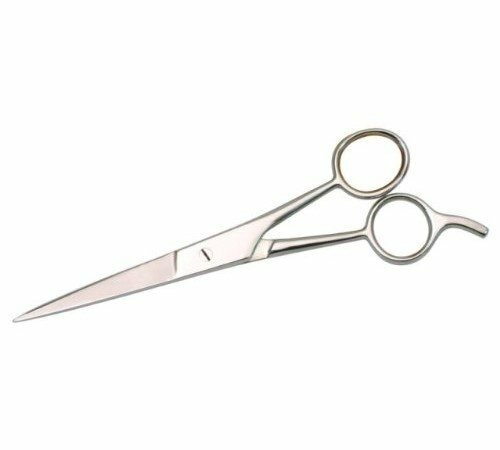 These LUXOR M505 7.5 inch Styling Shears are intended for hair cutting or, in other words, for hair styling. They are classic type hair cutting shears, therefore, they can be used for different hair cutting techniques, for example, slices, ships, points and blunts, giving perfect haircut. 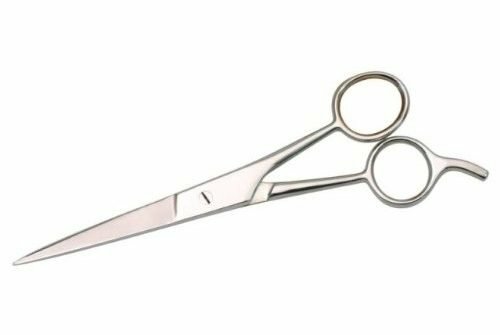 These LUXOR M505 7.5 inch Styling Shears are meant for hair cutting, using such hair cutting techniques as slices, chips, points and blunts. As they are made of ice tempered stainless steel, they have not only durability and longevity, but also sterility. This LUXOR product has razor edge hollow ground blades which are razor-sharp and can offer precise and smooth haircut both in barbershop and home. Their length is 7.5 inches which is considered to be long scissors, because most of hair cutting shears are 6.5 inches long, but their weight is about 3 ounces. These hair scissors have polished silver design, namely, they are silver color with slight polish for mirror brilliance. Another feature of this product is finger rest, but, unfortunately, it is not removable. They have no possibility to adjust the tension and they do not have finger inserts which can help to adjust the size and thus improve the comfort. This LUXOR product also does not come with any storage case. As these hair shears have all of necessary qualities and their price is affordable, they are suitable both for professionals and students.